My daughter Naomi and I encountered this Snapping Turtle, Chelydra serpentina, this past weekend. We first noticed it poking its head through the thin pieces of ice that covered most of the small pond. It swam up to the shore line and sat in the shallows. We crept closer and closer until we were almost on top of it. Hibernation seems to be a gradual process with Snapping Turtles and a response to not only the cold but also to the decreasing oxygen levels in the water below the ice. In the fall, Snapping Turtles spend most of the time buried in the mud and stop feeding at water temperatures of 15 C. In the early winter they move to a shallow spot and settle in. They generally pick a spot that is shallow enough so they can stick their head out of the water to breath without moving much, but deep enough so so they don't freeze. 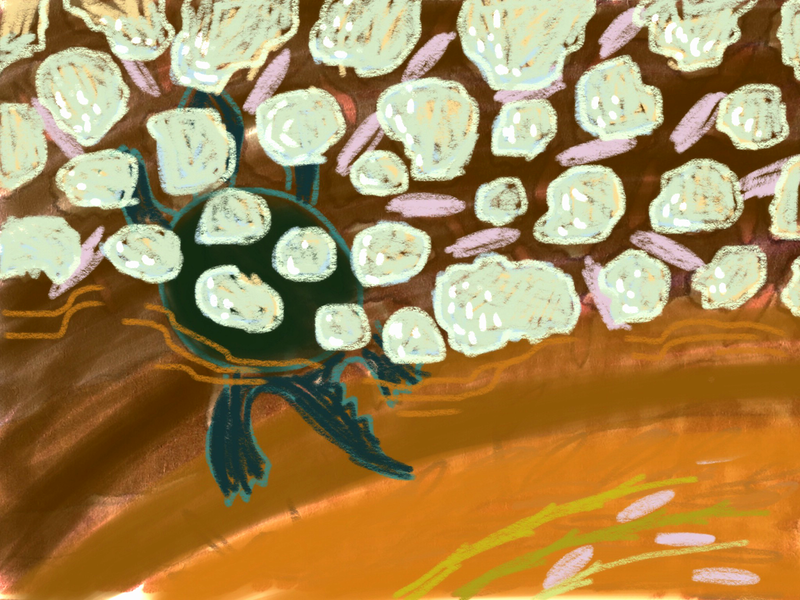 Multiple turtles may use the same hibernaculum. One the ice forms Snapping Turtles switch from breathing air to absorbing oxygen dissolved in the water through their skin and mouth. They don't need a lot of oxygen since the water temperature below the ice is just above 0 C and their metabolism has slowed way down. If dissolved oxygen is depleted, Snapping Turtles switch to anaerobic respiration. The by product of this type of respiration is toxic lactic acid (the same stuff that makes our muscles hurt during strenuous exercise). Snapping turtles may be able to counter the toxicity by neutralizing the lactic acid with calcium and carbonate from their shells. In the early spring Snapping Turtles become active again, gradually I would guess. They may sense changes in the water temperatures that cue them to stir from the mud. It has also been suggested that they sense the changing levels of light through the ice as it melts. To me, this makes more sense. Snapping turtles have been observed moving under ice in mid-winter, perhaps in response to a thaw that reduced the amount of snow covering the ice. It was exciting to watch this turtle with Naomi. I felt like we were witnessing some sort of ancient spring ritual; Snapping Turtles have been around for a few million years. The two photographs in this post were taken by Naomi.